expectancies on the market, for Wastewater Treatment. As wastewater treatment and AD systems designers in the past, we have at times found it practically impossible to reconcile client expectations for tank longevity, with client-specified design-life requirements for alternative tanks, using sectional mild-steel. As the years go by the design-life, for the all-important functionality of tanks has understandably been raised. This is usually beyond that which can reasonable be expected of traditional glass and epoxy coated steel technology. 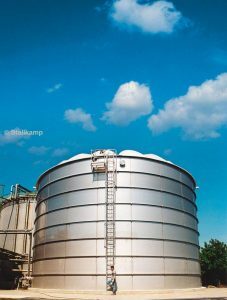 No matter how well these are specified (including with zinc coatings applied before layers of epoxy or glass), the problem of both long-term abrasion in mixed tanks, and physical damage, for mild steel tanks, has been a real-one. Occasional accidental tank wall impact, in particular, which can easily remove glass coatings in the area of impact, has ultimately been seen to a be major life-shortening concern for all mild-steel tanks. Worst of all is when an external impact on a mild-steel tank causes an undetected de-lamination of the coating on the internal face of such tanks. This may be concealed until corrosion takes place, and it becomes too late to prevent leakage. Stainless steel has for a long while been used for small tanks, and very successfully, especially in the food industry. Now, may be the time to use stainless steel for all large tanks, including the largest. Stainless steel may be a more expensive material than mild-steel and a substantial cost for large stainless steel tanks. But, the price premium in this case, is not so much that it greatly exceeds the combined costs of the necessary protecting coatings which must be applied (inspected regularly and maintained) for mild steel tank alternatives. As explained by Stallkamp in the PR below, stainless-steel does not in general (in wastewater applications) need any corrosion protection coating. This is due to the passive layer provided by unique chemical properties of stainless steel. 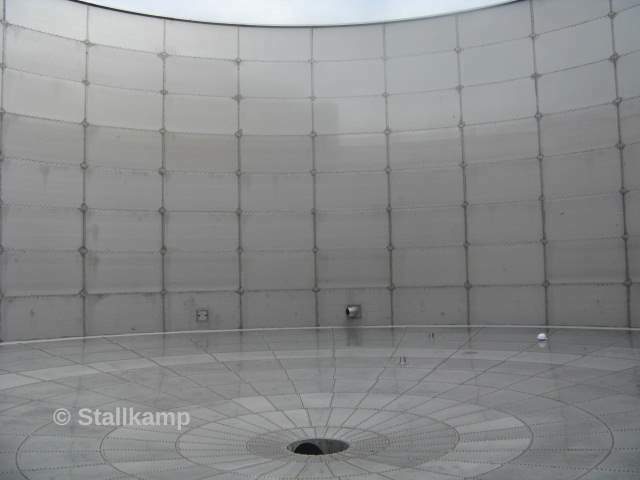 A further advantage of stainless steel tanks in the Stallkamp range is (we understand), the ability to install a matching roof and floor structure, also manufactured from stainless steel. This must tick another very important box for tank designers, where increasingly wastewater treatment facility tanks must be covered in order to minimise odours. Press Release: Dinklage 14.03.2018 – In the past, Stallkamp has repeatedly implemented projects for sewage treatment plants and the wastewater industry. 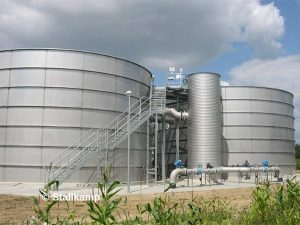 In addition to various sludge tanks, this also included complex wastewater treatment plants such as a stainless steel tank with a stainless steel floor or a funnel-shaped secondary clarifier. Stallkamp’s appearance at IFAT (14-18 May 18) is intended to strengthen its position in the wastewater sector. The fact that Erich Stallkamp ESTA GmbH has the necessary know-how is proven by various projects from the last 25 years. For example, an extensive wastewater treatment plant with two steel tanks (Ø15.52m, h=8.78m) was designed and installed in Bavaria as a wastewater collection tank. In addition, a corrugated steel tank (Ø2.75m, h=8.78m) serves as an equalising tank for the paper industry. Larger wastewater pre-treatment plants have also been installed for the food industry, as a reference plant in North Rhine-Westphalia shows. 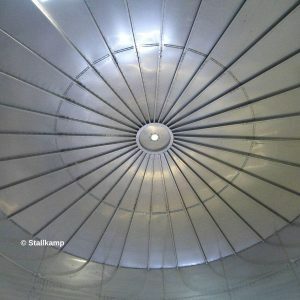 A stainless steel tank (Ø16.29m, h=10.03m) with self-supporting ribbed dome roof and various add-on parts was realised. Stallkamp has also proved to be a reliable partner for special designs. In Herzebrock, for example, a sewage treatment plant with several clarifiers (Ø outside 24.00m, Ø inside 3.88m, h=4.18m) was developed, which is controlled by means of overflow heights. Also the funnel-shaped secondary clarifiers (Ø top 7.65m, Ø bottom 1.40m, h=5.00m) with toothed gutter for a private brewery convinced with their stability and longevity. Currently, a wastewater project with three stainless steel tanks for an automobile manufacturer in Ingolstadt is being implemented. One of the tanks is a sludge storage tank for flocculated sludge (180 m3), which is equipped with many attachments and agitator technology. In addition, two clean water tanks (each 120 m3) are supplied. 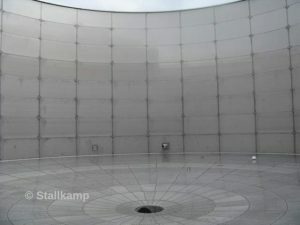 All three tanks are constructed with a self-supporting stainless steel roof. The decision for stainless steel is always worthwhile: the follow-up costs for maintenance and repair are reduced to a minimum. 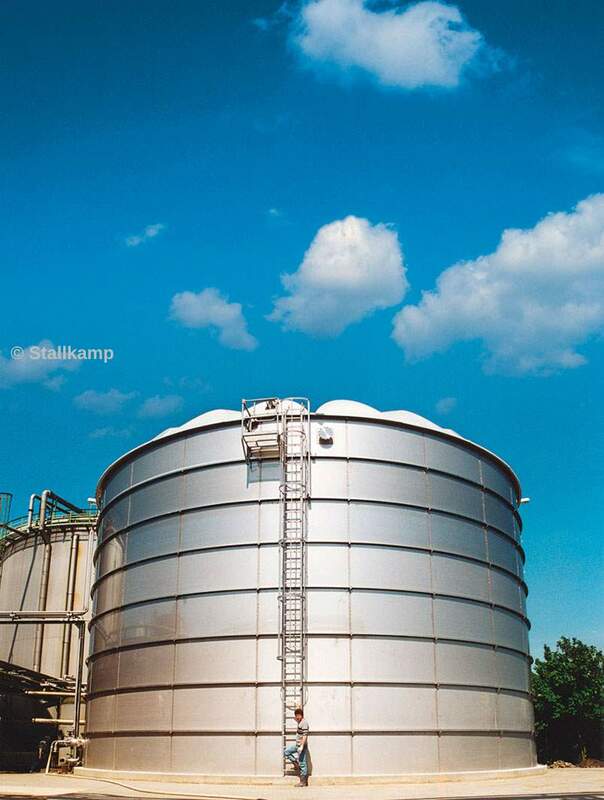 At the same time, the lifespan of the Stallkamp stainless steel tanks is almost unrivalled. Stainless steel owes its resistance to corrosion to a simple chemical reaction: due to its chromium content, an ultra-thin chemically resistant passive layer forms on the surface in conjunction with oxygen in the air or water. If the passive layer is damaged by external influences, it will form a new layer from the matrix of the stainless steel. Unlike other materials or material combinations, stainless steel can be completely and easily recycled after use. In addition to high-quality stainless steel tanks, Stallkamp also offers the associated pump and agitator technology. For special use in waste and clarification tanks, a full stainless steel mixer is recommended, which is designed for stirring liquids with a variable pH value, generally from pH 5.3 to pH 8.1 at room temperature of 20°C. The Stallkamp portfolio also includes separation technology, which is produced for a wide variety of applications and dry matter contents. From May 14-18, Stallkamp will be exhibiting at IFAT in Munich – the world’s leading trade fair for water, sewage, waste and raw materials management – to promote the wastewater business. Exhibition devices and references will be presented at booth 208 in hall A1 and qualified consulting services will be offered. 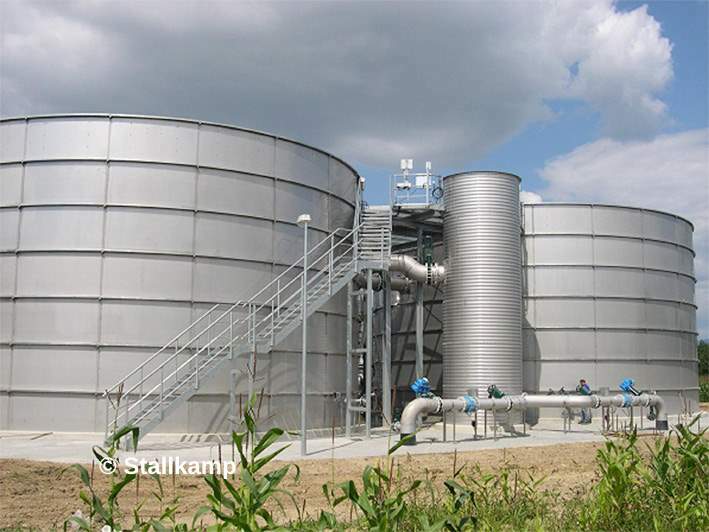 Learn more about Stallkamp products in the wastewater treatment sector. 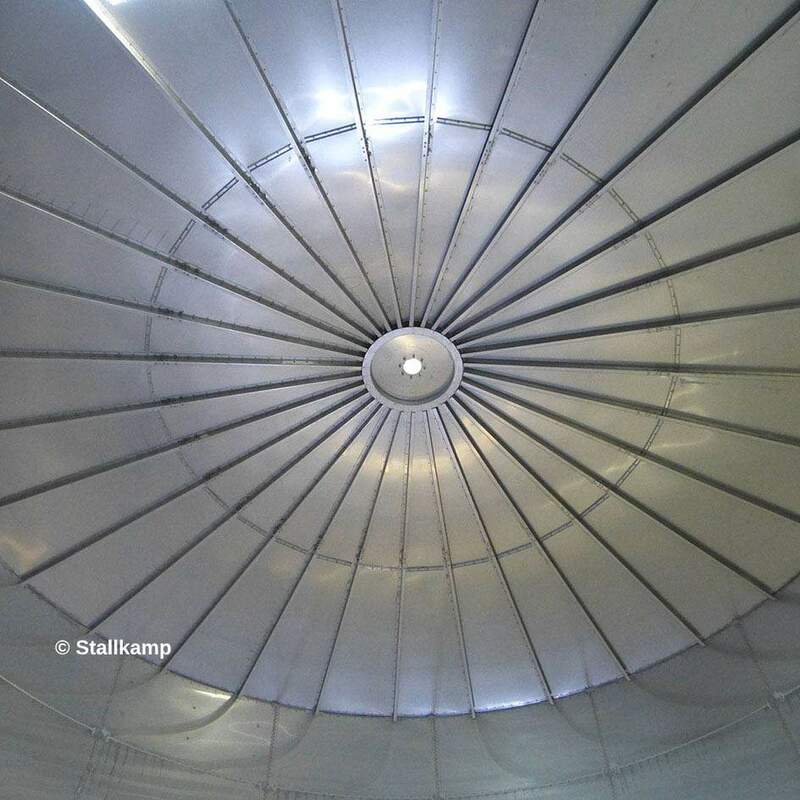 Stainless steel tanks may not be resistant to sulphur generated during anaerobic digestion plant operation. 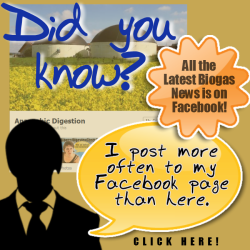 This has reportedly resulted in concerns in the past, and in respect of stainless steel tanks, which may need special anti-corrosion treatment above the water-line of the substrate, in anaerobic digestion plant digester tanks. Concrete tanks may be available for wastewater and anaerobic digestion applications to extended design-life beyond Glass or Epoxy Coated Mild-Steel tanks. can you send us a message please? You can save energy very easily. Place a layer of insulation around your hot water heater. You can find a hot water heater insulation kit available from your local home improvement stores. This insulation wraps around the heater keeping heat from dissipating. This, in turn, keeps your water hotter for longer, so you do not waste energy re-heating water over and over. The stainless steel tank, not mild steel which rusts, is a neglected product. Should be more used. Top score to your writer who gets my admire.